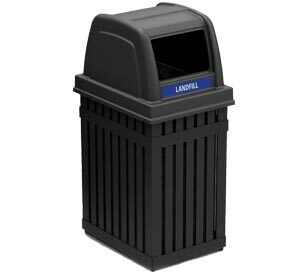 ArchTec Parkview trash receptacles provide an upscale, sophisticated appearance to any decor. Environmentally friendly and supports your facility's green initiatives. The base is constructed of heavy-gauge, fire-safe vertical steel rails for extreme durability with a weatherproof, black powder-coated finish. Built-in feet add stability, and a z-bracket anchoring system at the bottom of the unit allows it to be secured in place. 15% Post Consumer Recycled Steel. Eight white on blue decals: Trash, Aluminum, Glass, Plastic, Paper, Mixed Recyclables, and two recycle logos to create a personalized recycling center. Lid cable attachment keeps the lid secured to the base. Lid is constructed of durable polyethylene- won't rust, dent or chip. The double unit double-sided split dome top lid has a built in divider that keeps trash and recyclables easily separated. The square opening measures 11-3/4" x 7" and the rounded slot opening measures 8" x 5". Lid Includes Blue/White Decal Set. Includes removable, galvanized, black powder-coated liner with built-in handles and Grab Bag™ System to secure the liner in place and out of sight. The double unit includes two liners. 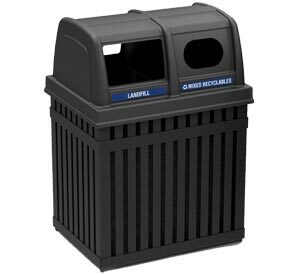 ►Need an Archtec Waste Waste Receptacles Fast?